and just built it upside down. i try to keep this in mind when working on creative projects. leaving the house still standing is always a goal. You if you get to 999 and 1’s missing! I love a good puzzle now and again. The combination of a puzzle, Spotify and earphones makes for a very relaxing couple of hours. very funny and true. the last puzzle i did, right before this, was missing 1 piece at the end and i never found it. yes, it is quite a relaxing enterprise. It’s a challenge well done and well worth it. Great work, Beth! Reading this post reminded me of the old saying, “There’s more than one way to skin a cat.” Remind me to call on you if I ever want to skin a cat (assuming I ever have a cat and it needs skinning). BTW, did you know it ain’t no sin to take off your skin and dance around in your bones (see today’s post on my blog if you don’t believe me). Great idea! The other not so good options made me laugh…lol! nobody expresses concepts as beautifully as beth…nobody! Guess that upped the difficulty level of this puzzle. Yay!!!! Congratulations. It’s beautiful and you did it. Smart move to do the puzzle upside down. It changes the way your brain looks at things. When I was learning to draw, one exercise that was very interesting (and successful) was to turn a picture upside down and then draw it that way! Whoops, thought about my reply & want to clarify something: do the puzzle with the picture upside-down. 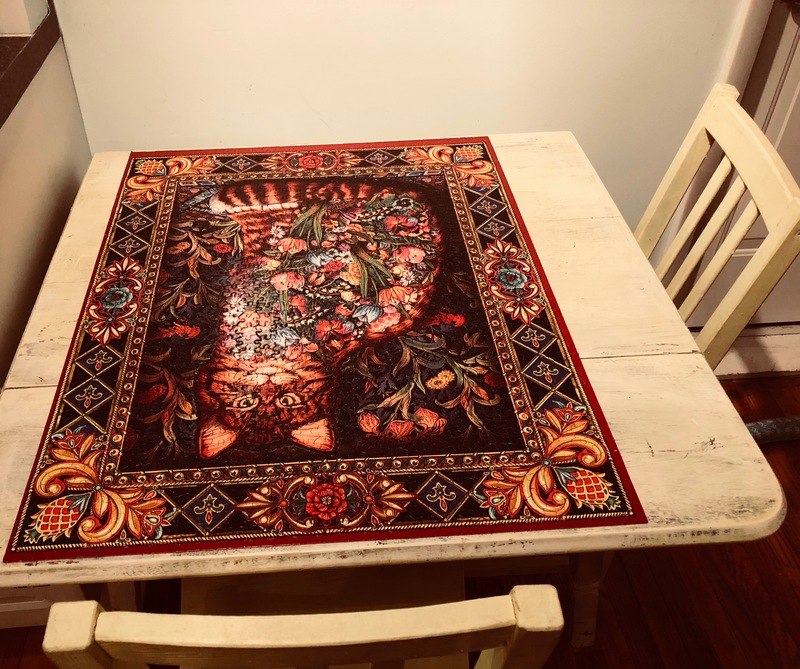 If the entire puzzle was upside down, the picture would be facing the table!